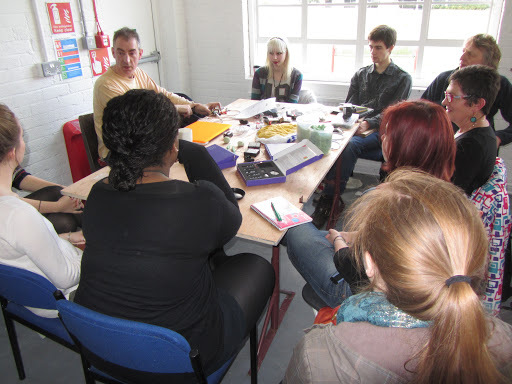 A short series of practical workshops exploring electronics, circuits and other materials. The workshops are open to Part Two, Three and Finalists and MA students. Interactive sensory objects made by and for people with learning disabilities www.sensoryobjects.com is a three year AHRC funded research project which explores the potential of newly developed easy-to-use electronics in making the experience of members of the user-group more vital and meaningful when accessing heritage sites. The project consists of a series of workshops that are fundamentally experimental and exploratory in character. We would like to share some of our research with students from the art dept giving them a series of practical hands-on workshops as an introduction to interactive and digitally-enhanced sculpture/installation. The aim is to introduce art students to the potential of using interactive technologies in sculpture and installation, and to enhance artworks and installations with the potential to make them responsive to people or the environment. To hold introductory workshops in the art dept for students led by Nic Hollinworth, which are experimental and exploratory in character. Students will design and develop multisensory interactive objects using sensors and rapid prototyping electronic Arduino boards to activate a particular webpage, video, sound, smell or movement, that act as triggers to information, thus augmenting reality for the user. Through a series of hands-on workshops led by Nic Hollinworth working with the art dept, we will introduce students to simple electronics using ‘squishy circuits’ to activate light, sounds or movement.